For nearly 6 years I've been taking photos for my blog and in that time I've learnt a lot about photography, going from using a basic digital camera to more recently a DSLR. Photography has always interested me though and as much as I love taking blog photos, it doesn't quite quench my thirst to take things further. When I bought my DSLR I vowed that I would use it for more than my blog, finally investigating whether my love for taking photos went further than snapping beauty products in my bedroom. I quickly realised though that the camera strap my DSLR came with didn't suit my needs at all, the weight of the camera was heavy on my neck and made my chronic back pain worse. 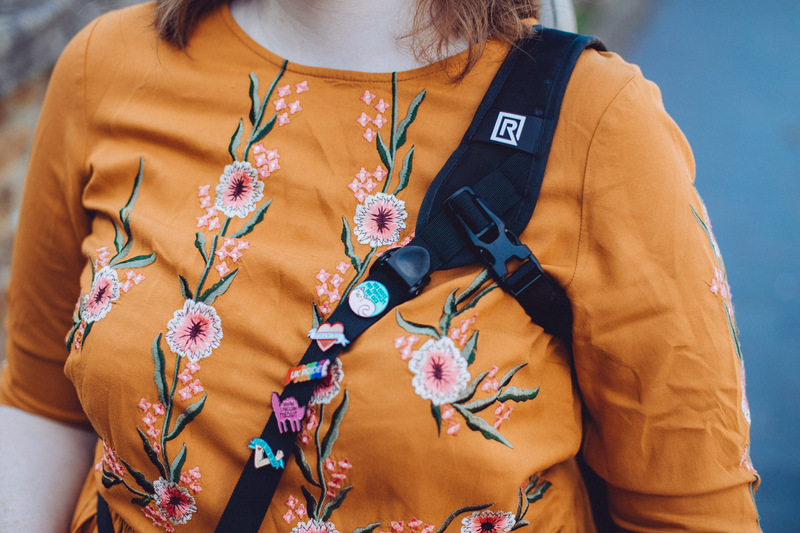 So, I started researching different camera straps that would shift the weight and make things easier for me and that's when I came across Black Rapid on Kaye's blog. She was using a strap that shifted the weight of your camera to your shoulder, instead of all the pressure landing on your neck. She's a professional photographer and so wears her camera for hours at a time, I wouldn't be using mine for quite so long but if it was comfortable for her for hours then it would definitely work for me for an hour or so. This is the kind of product that I like to call 'accidentally accessible', it wasn't created with disabled people in mind but it ends up being a really accessible product. 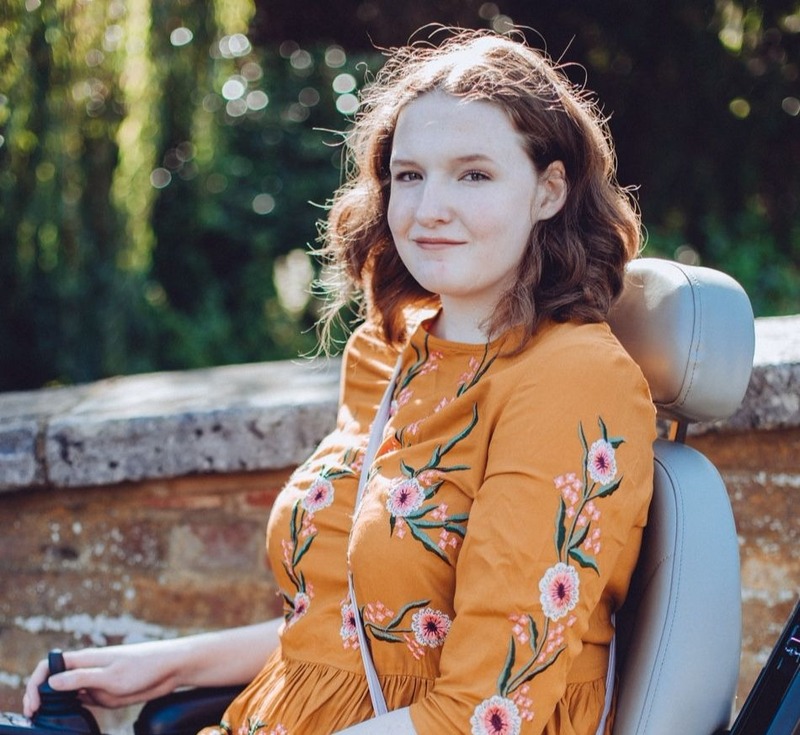 Black Rapid got in touch with me and I told them about how accessible their Curve Breathe strap in particular appeared, just from photos on their website and Kaye's blog it appeared to be perfect for chronic back pain sufferers. Sometimes when I explain to brands that their products are accidentally accessible they shy away from the topic and aren't interested in pushing the product as ideal for some disabled people but Black Rapid embraced what I had to say and very kindly sent me over the strap to try out! I've been trying it out for quite a few months now and had planned to do this review earlier but as you might have seen, life got in the way and I took a unplanned break from blogging but I'm back now and ready to tell you how much I adore this product! As said above, traditional camera straps that go round your neck really don't work for me, they put pressure on my back and in turn increase my chronic pain. I also found that the strap my camera came with was quite short and so I wasn't able to rest the camera on my lap and relieve the pressure, without taking the strap off and leaving my camera vulnerable to being stolen. The Black Rapid Curve Breathe strap rectifies both those problems though! The strap sits around your shoulder, with plenty of padding to make it comfortable and the camera sits on the opposite side of the your body, almost like an over the shoulder bag, and this helps to distribute the weight of your camera further. The strap is really adjustable and also longer than the traditional neck strap so I'm able to rest the camera on my lap when I'm not using it, or hang it to the side of my body, but having the option to completely take the weight off my body is nice. Your camera attaches to this strap by the tripod screw on the base of your camera and the camera isn't restricted to one space on the strap either, you can move it up and down making taking photos a breeze. There's no getting caught up in straps, or having to adjust it every time you want to take a photo, you can just bring it up to your face and back down again in one movement. It took me a few attempts to put on the camera strap at first, with a little help from Kaye when we took these photos but once you've put it on a few times it's easy to get the hang of it! This is definitely a practical product and whilst it isn't unattractive I wanted it to reflect me a little more and Kaye's use of pins on her camera strap inspired me to do the same. 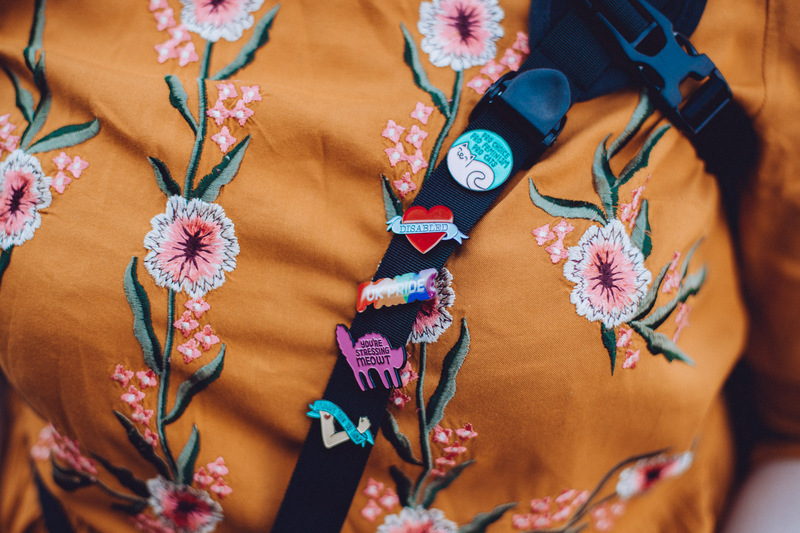 I'd been trying to figure out how to display my pins for months, not wanting to poke holes in my faux leather jacket, and putting them on my camera strap seemed like a genius idea, all credit to Kaye for that one. 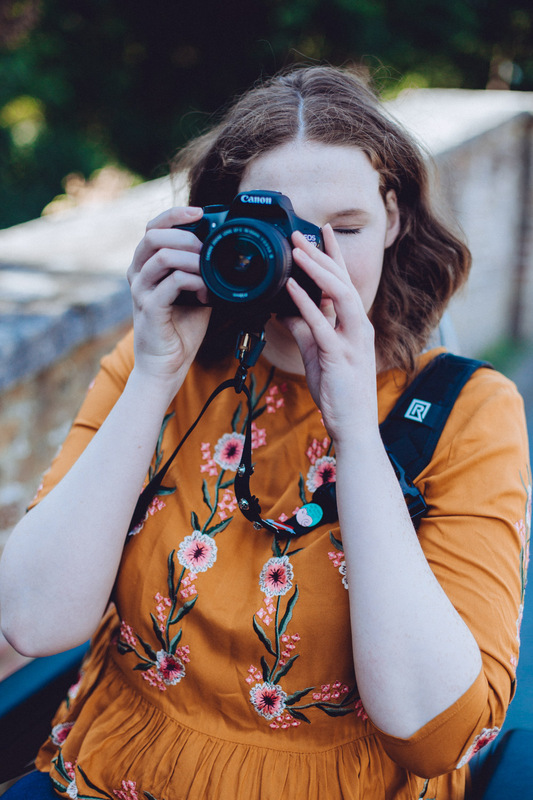 This camera strap has allowed me to finally pursue my love of photography and I've had so much fun being able to take my camera around with me, whether it be to the local park to take photos of the changing autumnal leaves or into London to capture the busy city. 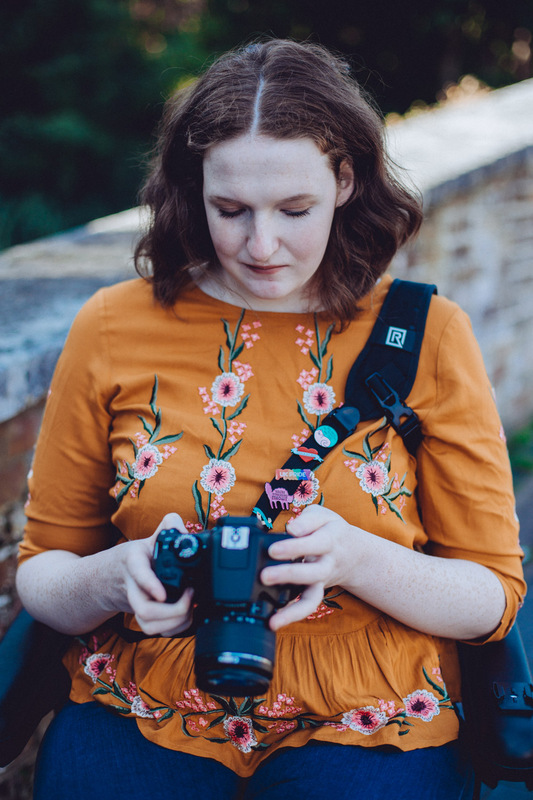 It's made photography more accessible to me and if you're a chronic pain sufferer too, or just someone who finds traditional camera straps uncomfortable, then this is the style for you. Check out the Curve Breathe camera strap and other Black Rapid products on their website. This really does sound like the ideal product for you, and I'm glad it'll give you the chance to properly explore your photography! Great to hear that they're eager to embrace the "accidental accessibility" elements of the strap too - it's a market that DESERVES to be wooed. Your Indian marriage proposal or matchmaking has taken place. You know that the next step is planning your Indian affordable wedding photographers toronto but where do you start? Read on further to discover what will be the next steps to take to prepare for your wedding.